Maybe you have been looking at reverse mortgage online and as you read and learn, the question keeps arising: ‘what about my spouse?’ This is a perfect starting point for understanding the long term effects of taking out a reverse mortgage as a couple. • As long as both spouses are age 62 or older, they can both be on the loan. If only one spouse is over the required age, a loan can still be obtained, but the loan will not continue for the ineligible spouse if the borrowing spouse were to pass away or leave the home permanently. • Always bear in mind that the reverse mortgage amount is calculated from the age of the youngest borrower. The older the age, the more money is available. • There are a few choices when it comes to the loan that will affect its status depending on who is listed as borrower(s). If both are on the loan, when one passes away the loan continues as it was originally set up. The loan will not become due until the other borrower passes away or leaves the residence. • If both are on the loan, if one spouse needs to leave the home permanently, such as to move into a health care facility, but the other stays in the home, the reverse mortgage will continue as originated. • If both are on the loan, and one spouse passes away, while it is true the remaining spouse will continue on with the reverse mortgage unscathed, things will change if they remarry. While remarrying will not affect the original borrower, it can affect the new spouse if the borrower were to pass away or leave the home permanently. 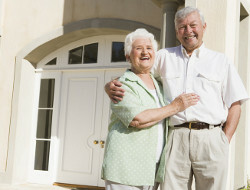 Reverse mortgage does not include the second spouse automatically. Refinancing or adding the new spouse would have to be considered. If you are married and considering a reverse mortgage choose a reputable reverse mortgage specialist to work with. They can lay out all your options and help you see the long term picture of what will happen in all the different possible scenarios. It is also especially important to make sure everyone feels comfortable and no one is being pressured into a scenario that could potentially end badly if the proper precautions are not put into place.